Usage time is limited to 30,000 hours or less Zero bright (fully-lit) sub-pixels for six months for units purchased on September 1, 2015 or later. See EIZO Bright Pixel Policy for details. Usage time is limited to 30,000 hours or less (10,000 hours for the LCD panel). 5 years subject to the usage time being limited to 10,000 hours. Brightness level of 800 cd/m2 or more and color temperature of 6500 K are warranted. Zero bright (fully-lit) sub-pixels for six months from the date of purchase. Usage time is limited to 30,000 hours or less. 5 years subject to the usage time being limited to 10,000 hours. Brightness level of 120 cd/m2 or more and color temperature of 5000 - 6500 K are warranted. Zero bright (fully-lit) sub-pixels for six months from the date of purchase. Usage time is limited to 30,000 hours or less 5 years subject to the usage time being limited to 10,000 hours if used within the recommended brightness of up to 120 cd/m2 and color temperature of between 5000 and 6500 K Zero bright (fully-lit) sub-pixels for six months for units purchased on September 1, 2015 or later. CX271, CX241, CS2730, CS270, CS240, CS2420, CS230 - Zero bright (fully-lit) sub-pixels for six months for units purchased on September 1, 2015 or later. Usage time is limited to 30,000 hours or less Zero bright (fully-lit) sub-pixels Six months from purchase date for purchases made on September 1, 2015 or later. All warranties are valid only in countries or territories where EIZO group companies and authorized distributors are located. For further warranty details, please visit our Contact EIZO page to get in touch with the EIZO group company or authorized EIZO distributor in your region. Exceeding the standard limited warranty for FlexScan or FORIS products, EIZO will offer an additional three (3) year warranty option at an extra fee from the date of expiration of the standard limited warranty (United States only). Please contact our office in the USA for more details. (l) Any deterioration of display performance caused by the deterioration of expendable parts such as the LCD panel and/or backlight, etc. (e.g. 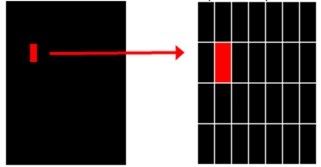 changes in brightness uniformity, changes in color, changes in color uniformity, defects in pixels including burnt pixels, etc.). EIZO's policy covers visible, bright (fully-lit) sub-pixels as detailed in the following table. 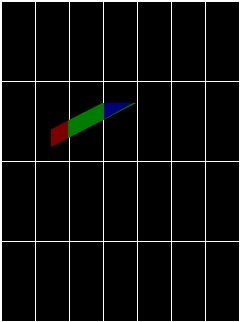 A red, blue, and green pixel that is always lit on a black background of an LCD screen is deemed a bright sub-pixel. 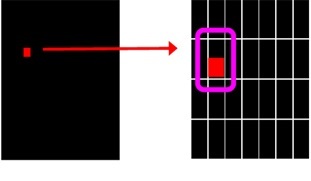 A pixel that is always dark or colored on a white background of an LCD screen is deemed a dark pixel. Dark sub-pixels are not covered by this policy. Six months from purchase date for purchases made on September 1, 2015 or later. 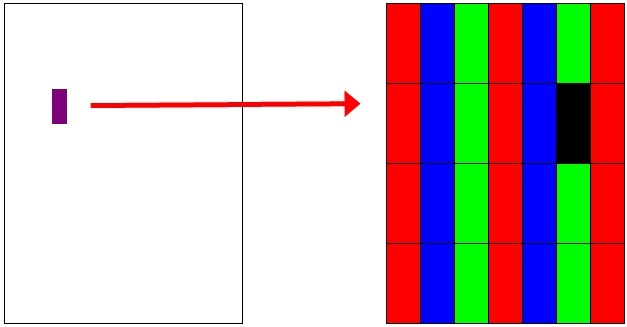 A full pixel (white) consists of one red, green, and blue sub-pixel. What Is a Bright Sub-Pixel? A bright sub-pixel is one that is fully lit. 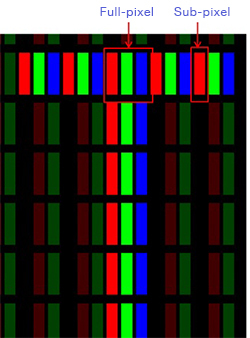 In the example below the red sub-pixel remains lit even when the surrounding sub-pixels are unlit. EIZO's Bright Pixel Policy Does Not Cover the Following Conditions. A sub-pixel that is always colored on a white background. You can request any of the following replacement parts for EIZO products for self-installation. Please contact us from here. Please refer to the User manual or Setup guide of your purchased product for identifying part numbers, and/or for detailed instructions on the installation for each replacement part. Product parts are available until up to three years after the monitor’s production has ended. If the requested item is unavailable, EIZO reserves the right to offer a substitute.